Sun | Strike of Lightning! It is too early to say exactly what this new data means for the heliosphere. The sun moves through interstellar space more slowly than previously thought and time seems to have a weaker interaction with the rest of the galaxy, according to a study released today in the journal Science. The engineer David McComas of the Southwest Research Institute, University of Texas, and his team have confirmed that the relative motion of the Sun with respect to the interstellar medium is slower than previously thought. The team used new measurements the Interstellar Boundary Explorer (IBEX, for its acronym in English) spacecraft, a small spacecraft remotely images generated by the interaction of particles at the edge of our solar system and helps researchers determine the exact position of solar system in the galaxy. The solar system is moving rapidly through space, traveling in a bubble of solar wind and magnetic field called the heliosphere. The boundary of the heliosphere where the solar wind interacts with the rest of the galaxy, marks the edge of the solar system, known as the interstellar boundary region. But new findings show that the Sun IBEX moves so slow that the pressure of material that flows around the heliosphere is 25% lower than expected, for what they believe is not enough to create a bow shock, a structural component that is believed to control the flow of cosmic rays of high energy. The finding suggests that the protective boundary that separates our solar system from the rest of the galaxy lacks the bow shock, as stated in scientific theories, and could have implications on how much radiation (in the form of galactic cosmic rays) coming into our solar system. 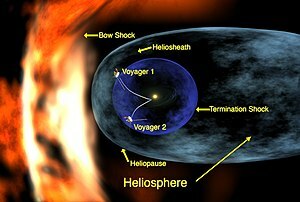 For about a quarter of a century, researchers believed that the heliosphere is moving through the interstellar medium at a rate fast enough to form a bow shock. However, data have shown that IBEX heliosphere actually moves through the local interstellar cloud at about 83,685 kilometers per hour, about 11,200 kilometers an hour slower than previously thought. This represents a rate slow enough to create more of a “wave” than a “bow” shock. “While it is true that there are bow shocks by many other stars, we believe that the interaction of our sun does not reach the critical threshold to form a shock, so that a wave is a more accurate representation of what is passing in front of our heliosphere, as well as that made by the bow wave of a boat that glides across the water, “said McComas. He noted that “it is too early to say exactly what these new data mean for our heliosphere.” He said you have to develop new research using these data, since the change in the way that galactic cosmic rays enter the solar system is important for space travel. What is taking energy from the sun? is this a new form that takes energy directly from the sun?